i just bought some awsome Desoto wirewheels but now i have a some questions. I've seen those rims or rims like that on some sweet volksrods here. But now i would like to know, what is the best way to mount them? so..
- where to get redrilled brakedrums or spacers/adapters. So what's your 2 cents? anyone something for sale? What is the Desoto bolt pattern ? 5 x 108 doesn't sound right. (Ford V8 powered) Single Cab. 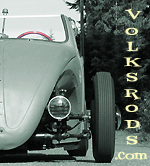 The front suspension is from a '71 VW bus, so it has power disc brakes and the standard five lug pattern for that year. Since I'm running a 9" Ford rear end, I wanted to run Ford rims all around. Up until then I'd been running a pair of 15"x8" custom wheels built by Stockton Wheels at the rear. Up front I'd been running stock 14" rims from the same Bay Window the front end had come from. I contacted Motorsport Technology (www.Motorsport-Tech.com) and spoke to Chris. He asked a number of questions including 'wheel offset.' He told me how thick the adapters would be and how much offset was doable without creating too much load on the adapters, or wheel bearings. At the time a pair of custom adapters came to $150.00 plus shipping. I then had Stockton make me a set of 15" x 7" rims with the offset recommended by M T.
I have used the Single Cab to haul lumber, firewood and tow a 22' Catalina sailboat with no problems with the adapters or hubs. They really know what they are doing. which is the same as the common later model Ford/Mopar. Can buy adapters from 4bolt VW to small Ford. See if you can find out if these wheels are hub centric or lug centric. Since they are from another make of car, and a very old one at that, wouldn't they be, ah, "ex-centric?" All kidding aside, on my old receipt under 'Part Number And Description' it reads, "Adapter-Non Hub Centric." how can i see the difference? Have heard of 4 1/4" bolt pattern. Will look around a little. IIRC, the stock 4 bolt drums only have enough meat where necessary. Might be able to get blank drums. I looked a while ago, couldn't find blank rear drums. overhere i find blank rear drums but no blank front drums..
i'm starting not to care anymore if i have to get them shipped..
this is the link i found..
spacer/adaptors seem complicated to make and drilling blank drums looks safer in my mind... or am i wrong? It looks to me as if those 'blank' drums are beefed up in the area where you'd drill for the various lug patterns. So drilling the Desoto pattern should be no big deal. There must be front drums available somewhere. so a little progress, now i hope to get my money back on these first wrong ones..
A little progress is better than no progress. Those wire wheels will add to the already 'high impression ratio' of your ride. yeah they will, cant wait..
Well... store credit anyway... but i couldn’t risk to lose that coupon anywhere..